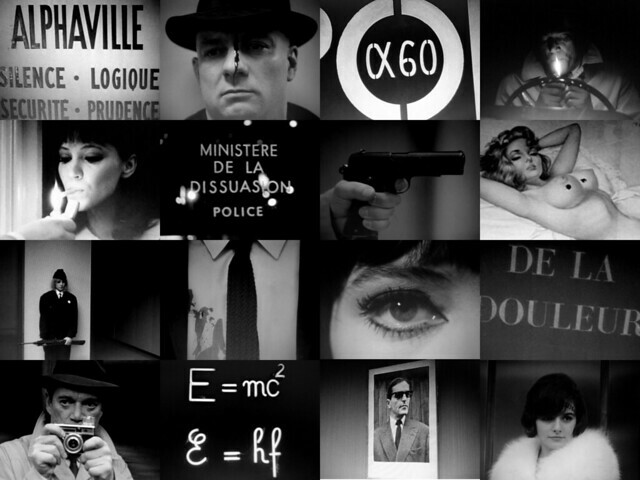 Jean-Luc Godard’s Alphaville (1965) was one of the first pieces of non-Anglo American cinema that I watched. It may have been diving in toward the deep end in some regards but something became very striking about the film as its running time trickled by. It said more than other dystopias, noirs or sci-fi but this “more” wasn’t to do with anything that could be described as a narrative idea. Instead, a number of scenes broke down any notion of cinema formalism and what it meant. All of sudden, the very serious realities of conventional films seemed grey. Alphaville made it very clear in its opening five minutes that making reality absurd could say far, far more than trying indefinitely for some vague, like-for-like take on whatever reality other films clawed desperately to convey. Sometimes reality can be too complicated to be conveyed by the spoken word. Because of this, the people of the film have created a machine which can control everything from the electricity to their emotions (or lack of). For the viewer (and potentially Godard), this machine is cinema. For an hour or so at a time, people openly give in to the seductions of being controlled. Some resist more than others (Lemmy Caution is the film critic) but the passive viewer is no more in control of their emotional states than the characters in Alphaville. As an opening to world cinema,[i] this was the equivalent to a stick of dynamite. 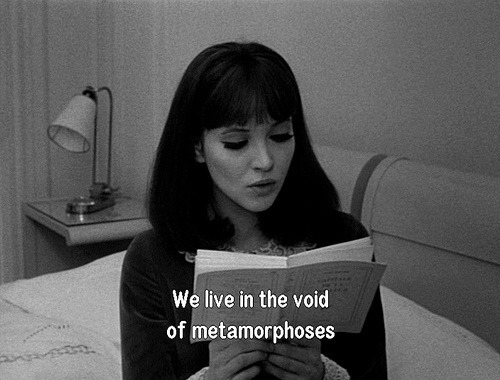 Cinema is, in the right hands, a powerful tool of beauty and control and Alphaville summed this up perfectly. All the sudden the absurdity of the scenarios that Lemmy Caution casually wandered into were not simply following the narratives that a desperate screen-writer batted away into a typewriter but were events questioning, from the start, the role of cinema. The violence of Caution’s initial unpacking in his hotel room highlighted another criterion; a ridicule of violence, rendered ridiculous by the sheer randomness of its timing. Having already been pestered by a third class seductress, Caution encounters a villain attempting to kill him while he prepares for a bath. The violence becomes a joke relatively quickly, both to the viewer and to the character, but this seems natural after the computer’s opening statement. How can cinema possibly convey the truth behind violence without stylising it? If it was believable (like in other Godard films such as Le Petit Soldat (1963) and Pierrot Le Fou (1965)) it would go against the film’s self-imposed dictum that in order to convey truth it must ultimately lie. This is most apparent shortly after this altercation where Caution lights his lighter with a single gunshot. In itself, this moment is comically silly but it is also the beginning of the disintegration of time in the film. He hasn’t lit the lighter for himself but for Natasha von Braun (Anna Karina) who needs it for her cigarette. What at first seems a product of Godard’s enthusiasm for jump cuts turns into a knowing laugh at the cause-to-effect mannerisms often relied upon in more solidified cinema. It is pre-empting the future, the effects and the natural progression of cinema. If it wasn’t in such a stylised manner, it could be shrugged off as a simple edit but time flows naturally in this way in Godard’s other work. They are connected by ideas rather than a constant stream of seconds and minutes. The film later reiterates its own message with another wonderfully realised visual cue, that of the execution of those who behaved illogically. The cinema of murder and brutalism is summed up in the machine gunning of the innocent into a swimming pool who are then finished off by being stabbed by synchronised swimmers. An action of visual beauty now is used as a means of execution and murder. This is simply a by-product of the machine-created world and therefore a product of cinema itself; where the ugly, the absurd and the brutal can be used to mean so much more than reality and realism. With most of this being within the film’s first five minutes (swimming pool executions aside), it didn’t require much afterwards to cement my interest in cinema further. It also didn’t require anything else to question the status quo of the film that accompanied my childhood. The nostalgia was now the only thing that anchored those films of the past in a wave of desire to escape into new worlds, not simply of sci-fi or film noir, but of absurdity. This absurdity wasn’t in a surrealist manner but instead a complete dismantling of the ironies of “realism” whatever that hollow word meant, means or is ever going to mean. [i] A term I greatly detest due to its sweeping, almost xenophobic connotations.